Distributed By – Rock Inc.
CD in jewelcase with 16-page booklet. 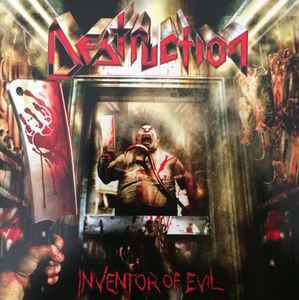 The "Inventor Of Evil" was recorded at: House Of Music Studios (Germany) and Little Creek Studios (Switzerland). But just like anything new with Metallica regretfully never will be a Master of Puppets again, this is never Eternal Devastation, those 2 albums are top ten albums anytime. But metal as said before somehow lost its way...and found its way back again 15 yrs later, almost at the same time for many bands. Kreator in 2001 and Destruction in 2000. Fueled by the Slipknots and the Lamb of Gods generation, bringing it all back to where it belongs. And many bands woke from their slumber of halfhearted metal to real music once again.